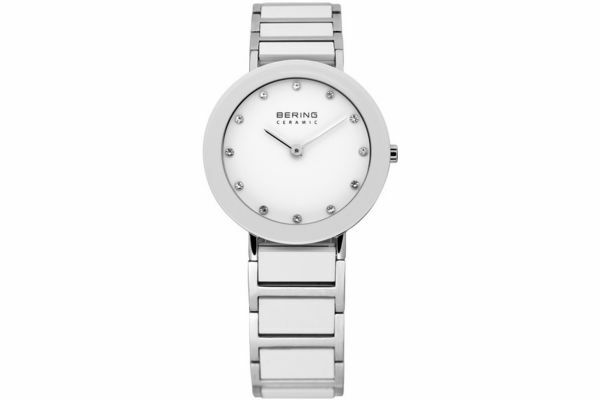 Synonymous with minimalistic design, Bering brings you another striking women’s watch featuring a crisp white ceramic link bracelet with highly polished stainless steel edges, complete with a stainless steel deployment fastening. Contrasting the elegant bracelet is the 29mm highly polished stainless-steel round case and alluring white ceramic bezel housing a bold white dial featuring delicate silver batons and adorned with 12 Swarovski crystal hour markers. Powered by Quartz movement and protected by Sapphire crystal glass, this Bering watch is water resistant up to 50 meters. Complete with a three year guarantee. Fluid in its design this watch lets its pure simplicity and striking colourway to speak for itself; a classic watch for all occasions. For us to size your new Bering Ceramic watch as accurately as possible, please take a look at our downloadable Watch Sizing Guide.